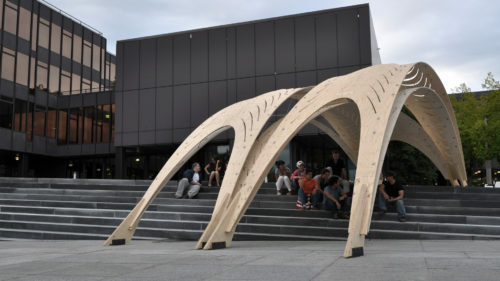 Out of a collaboration between the Emergent Technologies and Design program (EmTech) and the Chair of Structural Design at the Swiss Federal Institute of Technology (ETH), Zurich, a temporary light timber construction has been designed that functions as sun shading for parts of the grand stairs in front of the architecture department of the ETH. Based on bending behavior under the selfweight of over-sized sheets of plywood of up to 11 x 2.5 m, the design activates the material properties as the defining element in the transfer of forces. The exploration of the sheet material and the manipulation of its bending properties by controlling the number of layers of ply and the fibre direction of these layers was the starting point of the design process. 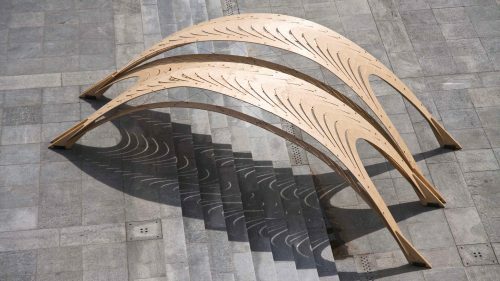 The precise geometry of the bending curve emerged out of the distribution of matter, the hierarchy within plywood as composite material and given load conditions. 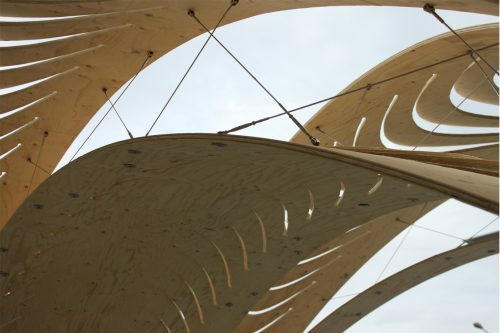 Based on a systematic investigation into the defining parameters, sheets of 18 mm thickness with fibres mainly in longitudinal direction have been used for the pavilion. Cuts within the sheets influence their bending resistance, enable a larger spatial enclosure and reduced wind load acting upon the structure, and additionally produce a shadow pattern on the stairs that are used as seating area during summer time. Varying the length of the sheets generates small variations of the bending curve that have been utilized for the overlapping and interlocking of adjacent elements resulting in a system of self-stabilizing vaults. The vaults are cross-braced by a sequence of cables. These cables distribute all other load conditions evenly within the edge strips, and so reduce additional deformation of the arched form to a minimum. 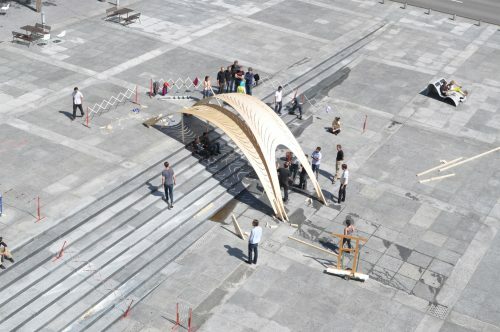 The design refinement as well as details of the construction and fabrication process of the pavilion has been worked out by a design team of EmTech students. The initial design idea derived from the winning entry of a competition team during an internal design competition within EmTech. In addition, the work of the design team has been informed by material test and design studies conducted during a workshop of all EmTech students at the ETH.